We call cucumber, pepino. 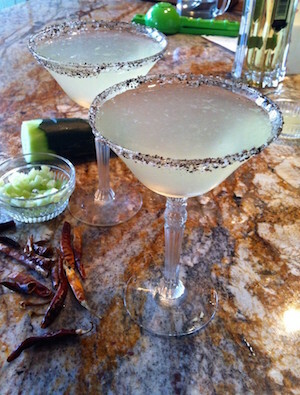 This cucumber chile martini draws upon two Mexican flavor traditions. The first is adding chile to pepino, a combination of freshness and piquant that is gorgeous. The second tradition is making sweets that combine chiles with various fruits. I think you’ll really enjoy the taste of sweetened elderberry flowers with chile. The backdrop is cucumber freshness. I use Chile De Arbol because it livens up the drink without adding strong flavor. 1. Coat the outer rim, not the inside, of a martini glass with lime juice and then dip it into the mixture of black pepper and salt. Set aside, preferably in the fridge. 2. In a cocktail shaker, add the cucumber and chile and muddle, then add the vodka, liqeur and lime juice. Add ice, cover and shake vigorously. 3. Pour into the prepared, chilled martini glass. Wow Adan! These cocktails look amazing! I have never heard of chiles in a drink before, what a great idea! Thanks for sharing!